The Church is known today as St Swithun’s, but over the last couple of centuries at least, also known as St Swithyn, St Swithin, or St Swithun. The first church in Woodborough would probably have been built between AD 971 and 1086 and would have been of Anglo-Danish workmanship, having a chancel, nave and western tower. The walls would have been made of wood logs run in with mud, small windows high up, and a pitched roof. Woodborough is recorded in Domesday as Udeburg, and the name means a stronghold by the wood. Three Saxon Thanes held the land and it is probable that a Saxon church stood on the present site since a clerk or priest for Woodborough had been established as a Prebend of Southwell by 1100. The Domesday record also shows that Southwell Minster held property in Woodborough to the extent of 3.5 carucates (420 acres), with the Prebend owning about 20 acres. He was thus one of the principal landowners (probably non-resident who would have had a Prebend house in Southwell) in a total population of probably less than 200. The Chapter House at Southwell Minster has a seat reserved for Woodborough confirming that the village was a Prebend of Southwell. The earliest known names are Walter le Mauclerc and Thomas de Ripon, both recorded in 1220 as Prebends for Woodborough. A schedule of Prebends, Vicars and Patrons is available on this website. Also, read Harry Gill's Thoroton paper on Woodborough Church and George Marriott's history of Woodborough, both can be found elsewhere on this website. This photograph shows the southern elevation. 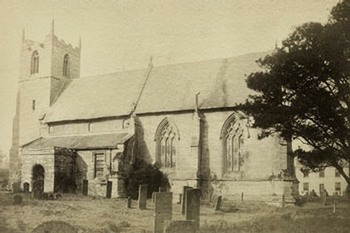 earliest known photograph of the church.